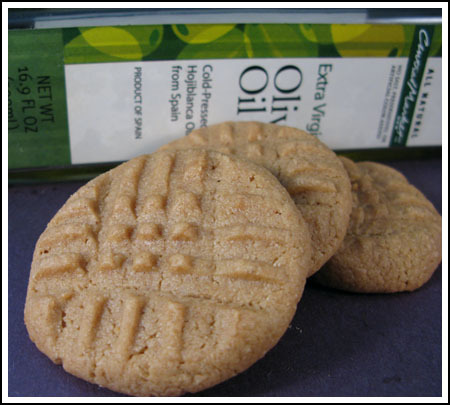 These olive oil peanut butter cookies are based on a recipe from Heidi Swanson. In addition to the olive oil and peanut butter, they are made with maple syrup and whole wheat pastry flour. I’d hoped these would be good, and they would have been had there not been overwhelming olive oil flavor. So, yikes! I’m not sure what happened here, but it seems the “cold-pressed Hojiblanca olives” they use in Central Market’s extra virgin olive oil pack too much of a punch. I’m going to try these again with peanut or coconut oil. I just finished making these with coconut oil and they are fabulous. Great pb flavor, no funny EVOO taste. Perfectly sweet, but not sugary. I really like them! So far I have liked everything I’ve swaped coconut oil for butter in my baking! Light Olive Oil is best for baking. It has a very neutral taste with most of the benefits of EVOO. It is just a more refined version. This sounds like a great recipe that just needs a little tinkering 🙂 Love your blog! Good point about the walnut oil. It seems like about the only thing I use it for is salad dressing, and the bottle usually goes bad before I get it used up. Actually, I love canola oil for it’s bland taste! I use it almost exclusively. I am embarrassed to admit that I don’t care for the taste of EVOO but I use it all the time for nonbaking. I only buy organic canola-either the 365 brand or Spectrum if it’s on sale. After a blind taste testing at WF I learned that I prefer Greek olive oil-much less pungent, imo. The Spanish and Italian (even the really god ones) taste “rancid ” to me. Walnut and other oils are very nice but it depends on the recipe as to whether I bake with them. Peanut oil is good, too. I haven’t tried baking with Coconut yet but I am eager to. It’s good to know some of your house looks just like mine! 😉 If you run out of cleaning projects, come on over! Sigh. The cookies look good and as I was reading about the olive oil,, I thought of trying coconut oil, then of course, you mentioned that. Louise, give me some time! Maybe in 30 years I’ll catch up with your sister. KAnn, do you like canola oil? I don’t use it. It has kind of a fishy taste to it that I don’t like. Sue, walnut oil is strong. I love using it in different things, but a little bit goes a long way. My vote is for peanut oil. I feel for you with the cleaning project. I need to carve out some time to do some of that myself. What a bummer that the cookies tasted too much like olive oil. My guess is that your olive oil was “too good” for this recipe. I wonder how walnut oil would be besides expensive? If you try it with different oil I’d love to hear how they turn out. They look good! I think I may try these with organic canola oil, Anna. I like Heidi’s site but I am not as enamored with her book as I thought I would be. I have some major cleaning to do , as well, but I am less ambitious than you lately! If that’s your junk, it doesn’t begin to compare to my sister’s house. It needs to be piled three feet high with a six inch path somewhere. And, noticeable old papers and yellow pages interspersed with the stuff.